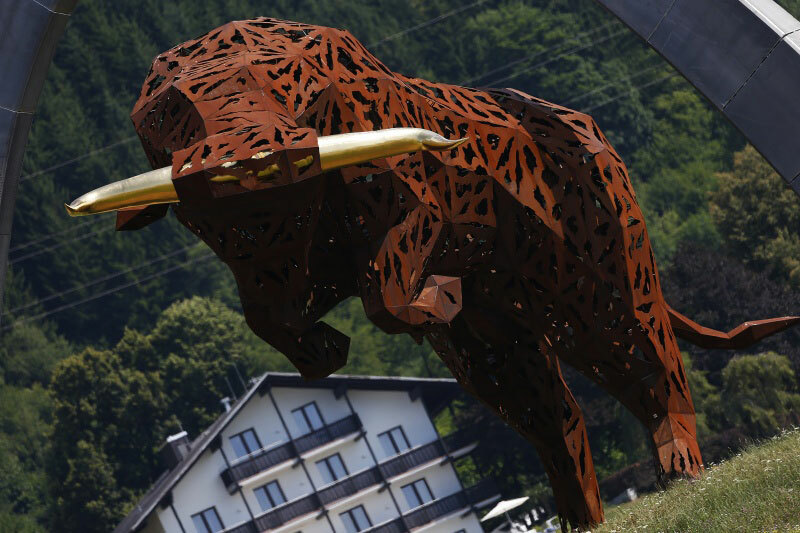 Let The F1 Spectator Austria page guide you around Spielberg’s Red Bull Ring as you make your travel plans for the 2017 Austrian Grand Prix. Its summertime in south-eastern Austria and the hills are alive with the sound of Formula One. The Red Bull Ring near Spielberg is a circuit that has been familiar to F1 in various forms since it first appeared on the F1 calendar in 1969 as the Österreichring. The circuit was shortened when it made a return to the sport as the A1 Ring in 1997, but like the new Spa, the circuit retained much of the character of the original. The setting amidst the magnificent alpine scenery of the Styrian mountains is unique and the look and sound of the F1 cars is enhanced because of it. Its most recent return to the calendar in 2014 was welcomed by many fans in an era when F1 had been edging away from traditional European race tracks. The Austrian Grand Prix is well attended by a knowledgeable and enthusiastic crowd who convene on the grassy hills around the circuit and in the campsites to create a music festival-like atmosphere. The Red Bull Ring is an old school Grand Prix goers experience far away from the glamour and conveniences of a large international city. It’s a place for the cool box and the fold up chairs; a place for true motorsports fans, with petrol running through their veins and carbon fibre for their bones, reveling in their natural habitat. Only rumored plans to revert to the old track layout of the much loved Österreichring could make the experience better than it already is. Until then thousands of happy F1 spectators will continue to enjoy one of F1’s great circuits the way it is. The region caters well to cyclists. You can even bring your bike and make use of cycle lanes connecting car parks and the circuit, where bike parks are provided. Stay up with all the on track events – race commentary is available on 97.2 MHz. The nearest airport with international connections is Graz, but you’re likely to find cheaper flights to Vienna. Summertime weather in the Styrian Mountains where the Austrian Grand Prix is held is usually clear and sunny. The areas elevation means it often avoids the sweltering heat of lower lying areas but you’d still be advised to pack some sun screen for those long days in the grandstands.